Apple debuted the next-generation iBook G3 at a press conference in Cupertino, California on May 1, 2001. The previous bold colors and bulky form-factor were abandoned, as was the handle, the latchless design and the additional power connectors on the bottom surface. 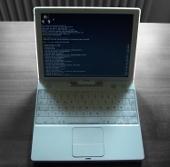 The resulting iBook was available in white only, and incorporated transparent polycarbonate in its casing. It was 30% lighter, and occupied less than 50% of the volume of the model it replaced, being smaller in all 3 dimensions. Despite that, it added an extra USB port and a higher resolution screen. Apple claimed the compact design did not sacrifice durability, saying it was 'twice as durable' as the previous model. With this revision, Apple began transitioning to translucent and white polycarbonate casings in most of its consumer line, such as the iMac and the eMac. In contrast, most of its professional products used an anodized aluminum finish. 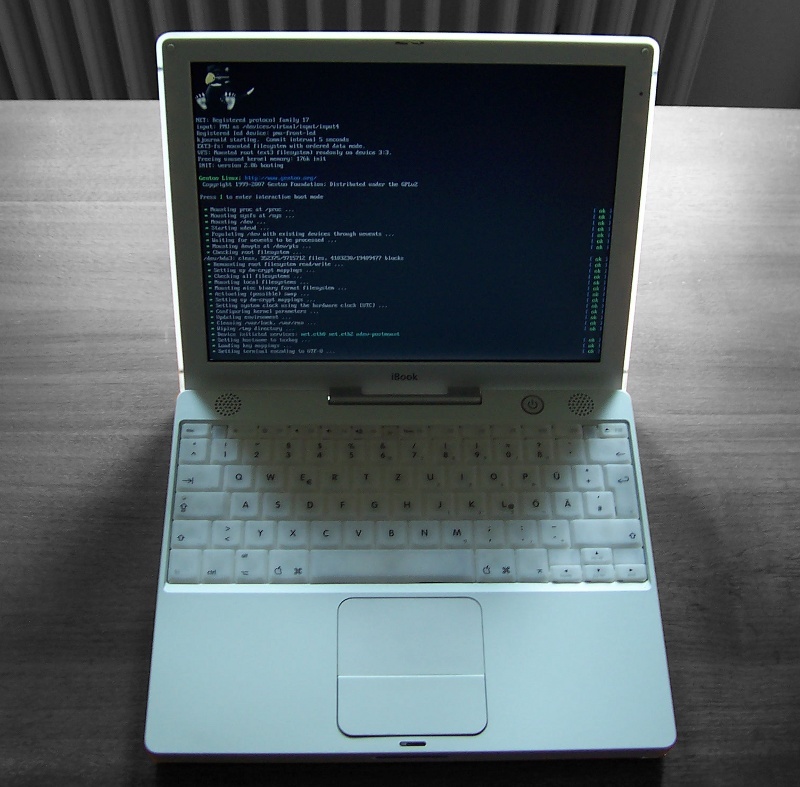 iBook G3 12" running Gentoo Linux. When MacOS X 10.2 became obsolete I decided to install Gentoo Linux on the iBook. A good point to start from is the Gentoo Linux PPC Handbook which describes the installation process and gives an introduction to Gentoo Linux itself. In the following sections I'll provide additional information about iBook specific topics that are not covered in the handbook. In order to use WPA-PSK with the Airport card you need an up-to-date firmware. Download it here, name it agere_sta_fw.bin and put it in the firmware folder of your kernel sources.